A stranger arrives on horseback at the border town of San Soleres, at the outskirts of the Raki star system. She is taciturn, watchful, and incredibly fast and accurate with her gun, able to outdraw and kill four bandits, out for blood and a quick solar buck, with startling ease. The innkeeper, Silvanito, asks the Stranger to stay in town, offer protection, become the Sherriff. The Stranger politely declines: "I can never call any town home. I'm a drifter, a lone gunfighter. 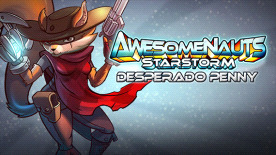 A desperado."